The Watch that's always right! This Talking Atomic Sports Watch clearly announces time, date, and more in a male voice. Automatically adjusts for standard and daylight savings time, and also can be adjusted for Pacific, Mountain, Central and Eastern time zones. Easy to customize alarm, hourly time announcements and more. Large 1-1/8" diameter face. Expansion band, white face with gray case and dial. Please note: The atomic function will not operate in Hawaii or Alaska. This item cannot communicate with the National Institute of Standards and Technology from either Hawaii or Alaska and therefore must always be set manually while in those states. For individuals who use this watch in either Hawaii or Alaska, time will not be automatically set and the calendar will not work. However, it may still be used in those two states as a regular 'manual-set' watch, but the calendar will not function at all. Cannot be sold in Canada or Europe. Heavy. Bulky. Not user freindly. Urgly. Instrunctional tape NG. Medication alert. Time reminder. Elderly. Average Health. Fairly intelligent. Athletic. Elderly. the voice is very clear. resets each night. resets each night. voice easy to understand. acurate to the second. Elderly. while driving. poor lighting conditions. poor vision. I have poor vision and the talking watch is more durable and acurate than others I have owned. Bulky. Heavy. Band pinches skin . low vision . Elderly. Dementia. This is a big watch for a tiny lady age 99, but it is easy for her to hear it and it keeps perfect time. Putting in a window makes it adapt to time changes. Because it is large, it makes putting on a sweater harder, and occasionally the band pinches her skin. Nevertheless, she likes it and it is reliable. Volume control missing from the design. Current voice is too low to be of value to hearing impaired. Watch band not adjustable. 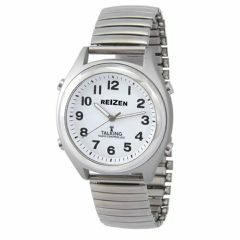 I would like to buy a "Reizen Atomic Talking Watch". The adds contain the watch diameter but not its thickness.Tell me the thinnest Reizen Atomic Talking Watch and its thickness? What are the the S1 through S4 buttons and how do they correspond to the 8 AM 10 AM 2 PM and 4 PM buttons? I have spent way too much time trying to get this watch to be on mid west time instead of eastern time. My husband and I both read instructions followed it and it still will not change. Any thing you can email me in a step to step instructions. Thanks. I have followed the directions in the manual that came with the watch, but it in not working to reset time.